On September 8th, the “China- Kyrgyzstan Modern Agriculture Demonstration Zone” jointly established by NWAFU and Kyrgyzstan Pastoral Animal Husbandry Co., Ltd. and Yangling Leda Biotechnology Co., Ltd. was officially inaugurated in Moscow, Chuy State, Kyrgyzstan. The inauguration ceremony was hosted by Kalis, Director of the Agricultural Office of the Moscow District. 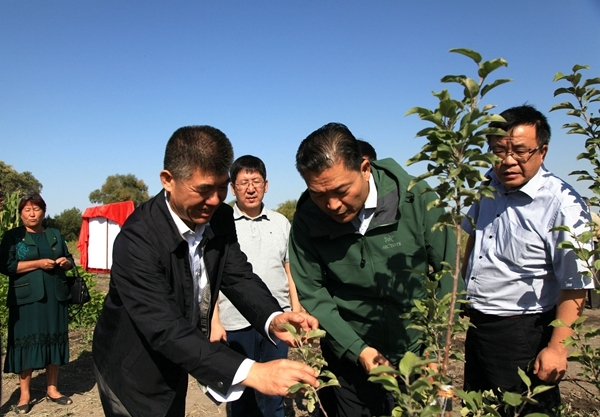 NWAFU Party Secretary Li Xingwang, the Director of the Kyrgyz National Project Office, Bayem Beit, and the Director of the Plantation and Inspection and Quarantine Bureau, Kubat, jointly unveiled the demonstration zone. Li Xingwang said that the establishment of the “China- Kyrgyzstan Modern Agriculture Demonstration Zone” is a concrete measure to implement the joint initiative from the heads of state of China and Kyrgyzstan, promote the development of the “Silk Road” economic belt, build a community of human destiny and benefit the two peoples. At the same time, he put forward requirements for the promotion and development of the demonstration park in terms of new achievements, scientific research and personnel training. “China- Kyrgyzstan Modern Agriculture Demonstration Zone” is the“ One Belt and One Road” agricultural science and technology education key cooperation project of NWAFU. It is located in the Moscow area of Chuy State in the suburb of Bishkek, the capital of Kyrgyzstan, which has received strong support from the Ministry of Agriculture and the local government of China and Kyrgyzstan. In 2018, the demonstration area of the first phase of the demonstration zone is 10 hectares, which respectively present the 7 new apple varieties introduced by NWAFU, 1 apple high-efficiency cultivation model, and 42 new corn varieties provided by the members of the Silk Road Agricultural Education Science and Technology Innovation Alliance. Under scientific planning and meticulous management of the joint construction from the three parties, the demonstration crops performed well and received high attention and unanimous approval from the local government, agricultural enterprises and surrounding farmers.